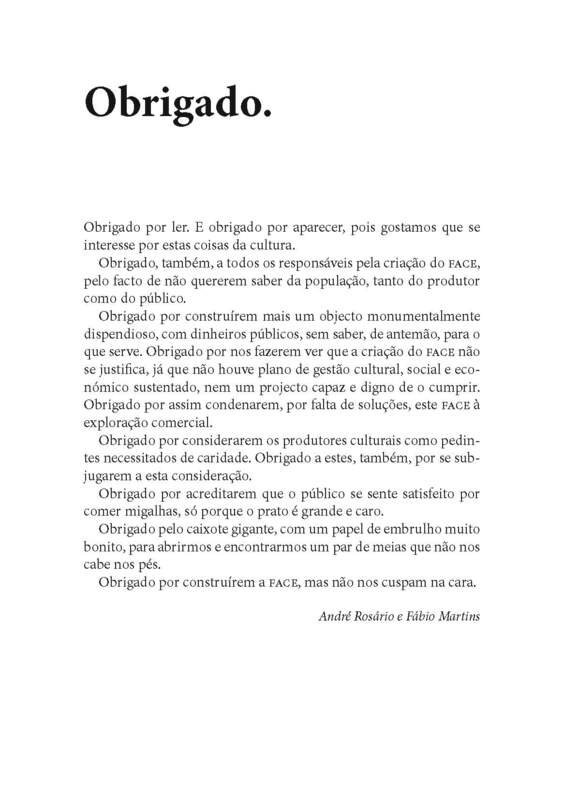 Intervenção em 2009 com Fábio Martins na inauguração do Museu Municipal de Espinho (FACE) com a distribuição do manifesto “Obrigado” em panfletos. Thank you for reading. And thank you for showing up, because we appreciate your interest in this cultural things. Thank you all, those of you who are responsible for creating FACE, because you don’t care about the population, nor the producer, or the public. Thank you for building another object, monumentally expensive, with public money, not knowing before hand, what to do with it. Thank you for making us see that creating FACE is not necessary, since there was no cultural or economical management plan, nor a project capable and worthy of fulfilling it. Thank you for condemning due to the lack of solutions, this FACE to commercial exploration. Thank you for considering cultural producers as beggars needing charity. Thank you also to them for submitting this role. Thank you for believing that the public is satisfied by eating crumbs just because the plate is big and expensive. Thank you for the giant box with pretty paper wrap, for us, only to open it and see a pair of socks that doesn’t fit. Thank you for building FACE, but don’t spit on our face. Intervention with Fábio Martins at the opening of Espinho Museum (FACE) distributing flyers of manifesto “Thank You” 2009.